Perched high on the hills of Lantau Island, the Big Buddha Hong Kong statue is one of the city’s most impressive sights and should be at the business end of any sightseeing list. Tian Tan Buddha or Big Buddha? You'll hear both names mentioned. 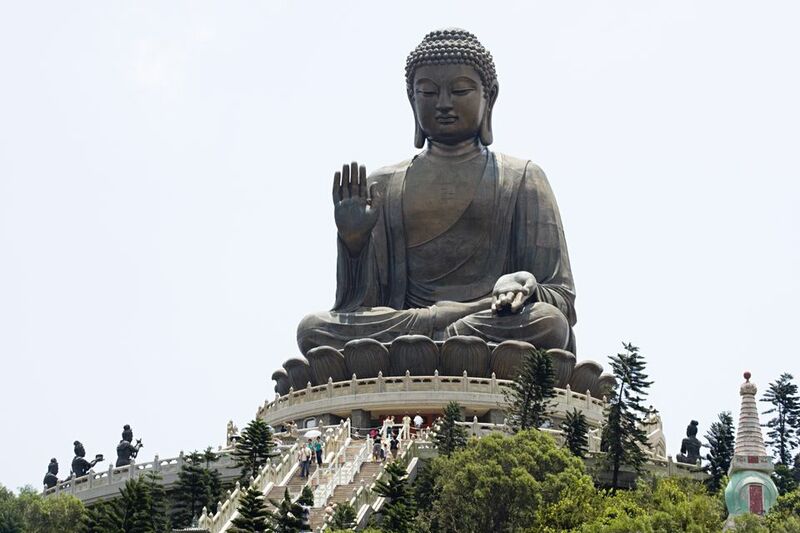 Big Buddha is the local nickname while the official name is the Tian Tan Buddha. Whichever name you hear, what's being referred to is a 34ft tall statue of a seated Buddha that’s part of the Po Lin Monastery complex. Weighing over 250 tons, the statue is the biggest seated bronze Buddha in the world - and one of the world’s top ten Buddha statues by scale. Originally built as a source of inspiration and a location for contemplation, its grandiose size has turned it into a tourist magnet and millions of visitors flock here each year. The statue is visible from all over Lantau and is arguably most impressive from a distance where it casts a shadow over the hills of Lantau. You can visit and climb part of the statue for free - these are 260 steps leading up from the base to the statue itself. On the way up you’ll spot a set of six Bodhisattva statues, (saints who gave up their place in heaven to help us mere mortals get a place) and at the summit is a small exhibition on the life of Buddha. From here you can also enjoy superb views over the lush greenery of Lantau Island, the shimmering South China Sea and the flights gliding in and out of Hong Kong Airport. Also worth visiting is the monastery itself to see the fine craftsmanship and ornate decoration of the Great Hall. Next door you can refuel at the bare bones, monastery canteen, which whips up some delicious vegetarian fare. You’ll need to buy a meal ticket from the counter at the foot of the steps to the Big Buddha. A popular trip year-round; give Saturday, Sunday and public holidays a miss if you can, when locals will troop to the statue in force. The best time is early morning on weekdays, although it's never too busy during the week. If you plan on walking to the statue or in the area, summer is best avoided as the humidity will leave you sweating buckets. One of the best days to see the monastery is on Buddha's birthday. There are crowds, but that's part of the attraction, as they gather to watch the monks bathe the feet of all the Buddha statues. Set on Lantau Island, the easiest way to the statue is to take a ferry to Mui Wo from Central then Bus No 2 from the Mui Wo Ferry Pier. Alternatively, the most enjoyable way to reach the Big Buddha is via the Ngong Ping Cable Car from Tung Chung MTR station. The cable car offers outstanding views over Lantau Island, although tickets aren't cheap. Our tip, take the Ngong Ping up the hill to the Big Buddha, then walk back down to the Mui Wo ferry pier through the superb natural surroundings.